Read It Later users keep content on their tablets and phones for an average of 96 hours after they’ve saved it. What does that say about the lifespan of content and how we value it? The other night I had this nightmare that I was trapped in a hot-dog eating contest. 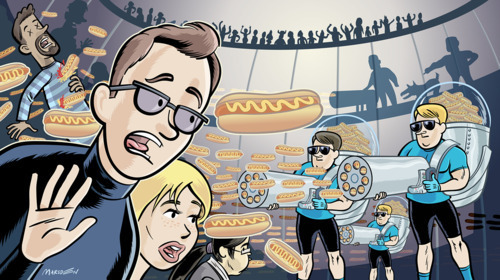 It was an extreme hot-dog eating competition, hosted inside a dystopian terrordome. Thugs in lycra shorts pointed hot dog cannons at our faces, bombarding us with thousands of franks. It was a Mad Max-meets-Gray’s Papaya world where split-second decisions were critical: Which franks would we try to eat? And which would we simply let bounce off our foreheads, plummeting into a pile of waste on the floor of the Hot Dog Terrordome? It wasn’t a pleasant way to eat. Besides the questions of manners, etiquette and hygiene, it simply wasn’t efficient to have food shot at you. There was no way to collect it, save it, or eat it, on our own terms. I awoke the next morning shaken, but thankful that humanity has embraced a different method for eating food. We have plates, Tupperware… even refrigerators where we can store food that we’ve collected, with plans to consume it over the days, weeks and months ahead. Why Is Online Content Still Being Shot At Us? -A business where the accepted distribution strategy is one in which publishers are forced to drop their most valuable product into a cannon and fire as many rounds as possible at its audience, no matter whether they can even consume it (and, importantly, no way to tell whether they did consume it). No one seems happy with the results. The way we are forced to consume devalues the content, it leads to diminishing returns for businesses that must see pageview growth year over year, and it leads to burnout of even the hungriest news staff. Ultimately, it has forced publishers and writers to change the way they create content. Felix Salmon recenty noted that the speed of blogging is getting so fast that it practically doesn’t matter what he writes. In an attempt to keep his team excited, Gawker’s new editor A.J. Daulerio enacted a system where one writer is assigned to the “traffic-whoring,” while the others get more time to cook up something that takes more time and reporting. It’s a creative solution to a seemingly unsolveable problem—how publishers can embrace the rapidly-increasing demands for content without losing their commitment to quality. But there’s a bigger challenge for the media business: How can we change the ecosystem and evolve to a model that puts renewed attention on quality over quantity? One answer, which I’ll present here in completely biased fashion, is to give control back to the consumers of this content. Let people take content with them, and they will soon value it more highly than if it is shot at them. Content creators will be rewarded with a longer social lifespan for the stories and videos they work so hard to create. And that ultimately lifts the value of a media brand. I believe this is actually possible. “Too much information” existed long before Twitter and—for anyone who’s had a stack of unread newspapers sitting in their den—long before the Internet. But Twitter’s real-time, reverse chronological stream exacerbated the problem. New content is now valued above all else, and our “old” content expires much more quickly. According to data gathered last fall by URL shortening service Bit.ly, links shared on Twitter had an average “half-life” of 2.8 hours. That is: After just three hours, most links on Twitter already accumulated 50% of the clicks they will ever receive from that shortened URL. The half-life for a link shared on Facebook was slightly longer but no less fleeting: 3.2 hours. In this study, the type of content mattered: The half-life was even shorter for breaking news, but for videos on YouTube, the attention span lengthened dramatically, to more than 7 hours. It’s both heartening to see that the Twittersphere responds to the right content, but depressing to see how many people got really excited that YouTube’s half-life was 7 hours. Content should have a much longer life than that. That’s fine, I suppose, but it feels like an inefficient hack. Can’t we create an ecosystem where the network does the ICYMI for us? I know we can do better than a 7-hour half-life, and I’ve seen it firsthand in my experience with Longreads, the community I founded in 2009. I started the service on Twitter, using a hashtag (#longreads) to create a community and a new taxonomy to discover and share stories over 1,500 words. In the past year we’ve had more than 10,000 stories shared. For these stories, retweets can happen hours, days, weeks and even months after the link was first shared. In many cases, Longreaders are reading a story the old-fashioned way—immediately after clicking on a link that interests them. But in other cases, they are saving the link to “read later”—using a time-shifting app like Read It Later (where I’m an editorial advisor). For Read It Later’s 4 million users, they now have a place to keep the content that they think will be interesting or enlightening. They can return to it when they have time for a 2,000-, 4,000-, or 26,000-word story—say, on the couch at night, or on a commute, or on a flight. So, if you’re still thinking about hot dogs, time-shifting could be the “takeout bag”—or the dinner plate, or the refrigerator. You get the idea. The simple logic is this: Give a user the opportunity to save something, and they will have access to it for a longer period of time, increasing the odds over time that they will eventually consume it. This will occur at the time and place of their choosing. Not only that, but once they consume it, they will share it at the time they complete it, and they will have effectively extended the half-life of that particular URL on Twitter, Facebook and Tumblr. It’s a new long tail for the post-SEO world. For publishers, time-shifting can mean the difference between 3 hours, 7 hours—and a number like 96 hours. That last number is the average length of time a Read It Later user keeps an article or a video in their queue before they mark it as viewed. We know that mobile devices and time-shifting are affecting when and where we enjoy our content. People spend the day in “hunter-gatherer” mode, and then use evenings, weekends and commutes to dive into the content they’ve saved. We know that bylines matter: Our examination of the “most-read authors” last fall proved that readers are loyal to writers, and they are just as likely to read a 2,000-word story as they are to read a 300-word story. Attention spans do still exist, and there’s an audience hungry for it. As we start to dig into consumption patterns, we see that users are controlling when and how they engage with content. It doesn’t mean there’s less of it, and the content is still being shot at us, but we now have tools to help capture this content and put it to use when the moment is right. This, the digital equivalent of a takeout bag, may just help us rethink how we value content on the web. And for publishers, it can help us rethink what we create. Special thanks to illustrator Ian Marsden (@marsdencartoons) for bringing my hot-dog nightmares to life.